Xia Brookside is the daughter of Robbie Brookside. January 23, 2016 – Empress Pro: Lizzy Styles defeated Xia Brookside. February 26, 2016 – ICW: ICW women’s champion Carmel Jacob defeated Kay Lee Ray and Xia Brookside in a 3-way match to retain the title. March 12, 2016 – EVW: Xia Brookside defeated Danielle Hunter. April 10, 2016 – IPW:UK: Pollyanna defeated Chakara, Tennessee Honey and Xia Brookside in a gauntlet match to become #1 contender for the women’s title. April 16, 2016 – EVW: Lana Austin defeated Xia Brookside. April 17, 2016 – JDW: Xia Brookside defeated Lana Austin. May 14, 2016 – Empress Pro: Xia Brookside defeated Toni Storm in the semi-finals. Xia Brookside defeated Kay Lee Ray to win the Empress Pro Invitational. June 4, 2016 – IPW:UK: Tennessee Honey defeated Amy, Chakara, Dhalia Black, Laura Di Matteo, Nightshade, Rhia O’Reilly and Xia Brookside in a 8-way match. June 19, 2016 – JDW: Lana Austin and Natalie Wild defeated Lizzy Styles and Xia Brookside. June 26, 2016 – PWU: Xia Brookside defeated Toni Storm to win the women’s title. July 9, 2016 – NWWA: Leah Owens and Lucy Cole defeated Lana Austin and Xia Brookside. July 17, 2016 – Kamikaze Pro: Xia Brookside defeated Nadia Sapphire. August 7, 2016 – RevPro: Jinny Couture defeated Xia Brookside. August 27, 2016 – Kamikaze Pro: Shanna defeated Xia Brookside. September 3, 2016 – GWF: Xia Brookside defeated Pollyanna in the 1st round. Sweet Saraya defeated Laura Wellings and Xia Brookside in a 3-way match to win the GWF Women’s Wrestling Revolution tournament. September 25, 2016 – PWU: Katey Harvey defeated Xia Brookside, Lauren La Roux and Martina The Session Moth in a 4-way match to win the women’s title. October 1, 2016 – LCW: Xia Brookside defeated Eliza Roux. October 2, 2016 – TCW: Lana Austin and Little Miss Roxxy defeated Lizzy Styles and Xia Brookside. October 23, 2016 – IPW:UK: Xia Brookside defeated Erin Angel in the semi-finals. The Amazon defeated Xia Brookside to win the tournament and become #1 contender for the women’s title. October 29, 2016 – VWWA: Violet Vendetta defeated Xia Brookside. November 5, 2016 – LCW: Xia Brookside defeated Alexis Rose. November 6, 2016 – HOPE: Bobbi Taylor defeated Xia Brookside. November 11, 2016 – BWP: Lizzy Styles defeated Alexis Rose, April Davids and Xia Brookside in a 4-way match. November 25, 2016 – Kamikaze Pro: Xia Brookside defeated Alex Windsor. December 10, 2016 – Ironfist: Chris Custodio, Hari Singh and Xia Brookside defeated Alex Gracie, Alex Windsor and Dan Moloney. December 16, 2016 – EWE: Kat Von Kaige defeated Xia Brookside to qualify for the Valkyries Title Tournament. December 17, 2016 – Bellatrix 22: Amarah and Amber Rox defeated Erin Angel and Xia Brookside. January 27, 2017 – SWA: Kat Von Kaige defeated Xia Brookside. February 11, 2017 – AOW: Lana Austin defeated Xia Brookside to retain the women’s title. March 10, 2017 – Bellatrix 24: The Angelics (Erin Angel and Xia Brookside) defeated Sigma (Amarah and Amber Rox) by disqualification. April 1, 2017 – Kamikaze Pro: Rosemary defeated Xia Brookside. April 8, 2017 – Ironfist: Millie McKenzie and Xia Brookside defeated Domina and Kat Von Kaige. April 28, 2017 – Kamikaze Pro: Xia Brookside defeated Katherine Darcy. May 12, 2017 – Bellatrix 25: The Angelics (Erin Angel & Xia Brookside), Nikki Knight and Saraya Knight defeated Sigma (Amarah, Domina, Innocence and Shax) in a tag team elimination match. June 3, 2017 – GWF: Xia Brookside defeated Lana Austin to qualify for the women’s revolution tournament. June 10, 2017 Ironfist: Chris Royals, Killian Jacobs, Millie McKenzie and Xia Brookside defeated Dani Luna, Joey Scott, Melanie Price and Xander Cooper in a tag team elimination match. June 17, 2017 – Kamikaze Pro: Lana Austin defeated Xia Brookside. June 23, 2017 – PCW: Saraya Knight defeated Xia Brookside. June 24, 2017 – Wrestling Midlands: Xia Brookside defeated Domina and Millie McKenzie in a 3-way match. July 16, 2017 – Stardom: Gabby Ortiz, Mary Apache and Xia Brookside defeated Hiromi Mimura, Konami and Starlight Kid. July 23, 2017 – Stardom: Gabby Ortiz and Xia Brookside defeated Team Jungle (Kaori Yoneyama and Natsuko Tora). July 30, 2017 – Stardom: Konami, Mary Apache and Yoko Bito defeated Gabby Ortiz, Shanna and Xia Brookside. August 6, 2017 – Stardom: Queen’s Quest (AZM, HZK and Viper) defeated Gabby Ortiz, Toni Storm and Xia Brookside. August 13, 2017 – Stardom: Toni Storm defeated Xia Brookside to retain the SWA Undisputed World Women’s Title. August 19, 2017 – Stardom: Xia Brookside defeated Kris Wolf. August 20, 2017 – Stardom: Queen’s Quest (AZM and Viper) defeated Mary Apache and Natsuko Tora, Ruaka and Xia Brookside & Shiki Shibusawa and Starlight Kid in a 4-way tag team match. August 19, 2017 – Stardom: Kagetsu defeated Xia Brookside. August 27, 2017 – Stardom: Hana Kimura defeated Xia Brookside. September 2, 2017 – Stardom: Viper defeated Xia Brookside. September 3, 2017 – Stardom: Yoko Bito defeated Xia Brookside. September 10, 2017 – Stardom: Mayu Iwatani defeated Xia Brookside. September 16, 2017 – Stardom: Kay Lee Ray, Toni Storm and Xia Brookside defeated Mary Apache, Natsuko Tora and Shiki Shibusawa. September 18, 2017 – Stardom: Hiromi Mimura defeated Xia Brookside. September 23, 2017 – Stardom: Hiromi Mimura and Jungle Kyona defeated Mary Apache and Xia Brookside. September 24, 2017 – Stardom: Mandy Leon and Xia Brookside defeated Konami and Shiki Shibusawa. October 1, 2017 – Stardom: Xia Brokoside defeated Shiki Shibusawa. October 21, 2017 – Ironfist: Melanie Price defeated Athena Furie, Dani Luna, Domina, Kaggy, Sofia Ari, Xia Brookside and Zoe Lucas in a 8-way match. October 29, 2017 – Kamikaze Pro: Xia Brookside defeated Kat Von Kaige. December 3, 2017 – Kamikaze Pro: Shanna defeated Shax and Xia Brookside in a 3-way match. December 8, 2017 – Bellatrix 27: Sigma (Amarah and Domina) defeated The Angelics (Erin Angel and Xia Brookside). December 14, 2017 – IPW:UK: Xia Brookside defeated Jayde. December 17, 2017 – IPW:UK: Xia Brookside defeated Livvii Grace to win the women’s title. December 23, 2017 – APEX: Jayde defeated Mia Cortez and Xia Brookside in a 3-way match to retain the women’s title. December 30, 2017 – SWE: Kay Lee Ray defeated Xia Brookside to retain the Queen Of Southside title. January 3, 2018 – Stardom: Miranda and Xia Brookside defeated Konami and Starlight Kid. January 5, 2018 – Stardom: Mary Apache and Nicole Savoy defeated Kay Lee Ray and Xia Brookside. January 6, 2018 – Stardom: Queen’s Quest (HZK and Momo Watanabe) defeated Kay Lee Ray and Xia Brookside. January 7, 2018 – Stardom: Kay Lee Ray and Xia Brookside defeated Konami and Mary Apache. January 13, 2018 – Stardom: Oedo Tai (Hana Kimura, Kagetsu and Natsu Sumire) defeated Kay Lee Ray, Nicole Savoy and Xia Brookside. January 21, 2018 – Stardom: Team Jungle (Jungle Kyona, Kaori Yoneyama and Natsuko Tora) defeated Miranda, Nicole Savoy and Xia Brookside. January 28, 2018 – Stardom: Kaori Yoneyama and Ruaka defeated Hanan and Xia Brookside. February 4, 2018 – Stardom: Queen’s Quest (AZM, HZK and Momo Watanabe) defeated Miranda, Starlight Kid and Xia Brookside. February 10, 2018 – Stardom: Team Jungle (Jungle Kyona and Natsuko Tora) defeated Nicole Savoy and Xia Brookside. February 18, 2018 – Stardom: Miranda and Nicole Savoy defeated Queen’s Quest (AZM and HZK), Starlight Kid and Xia Brookside & Team Jungle (Jungle Kyona and Natsuko Tora) in a 4-way tag team elimination match. February 24, 2018 – Stardom: Xia Brookside defeated Natsuko Tora to retain the IPW:UK women’s title. Bea Priestley, Miranda and Nicole Savoy vs. Jungle Kyona, Toni Storm and Xia Brookside ended in a time limit draw. March 3, 2018 – Stardom: Bea Priestley, Toni Storm and Xia Brookside vs. Oedo Tai (Hana Kimura, Kagetsu and Natsu Sumire) ended in a time limit draw. March 4, 2018 – Stardom: Io Shirai defeated Xia Brookside. March 21, 2018 – Stardom: Bea Priestley defeated Shiki Shibusawa and Xia Brookside in a 3-way match. March 25, 2018 – Stardom: Queen’s Quest (HZK, Io Shirai and Viper) defeated Bea Priestley, Toni Storm and Xia Brookside to retain the Artist Of Stardom title. March 28, 2018 – Stardom: Faby Apache & Mary Apache defeated Bea Priestley & Xia Brookside and Kaori Yoneyama & Keneisha Moon and Queen’s Quest (AZM & HZK) and Team Jungle (Hiroyo Matsumoto & Natsuko Tora) in a tag team gauntlet match. March 31, 2018 – Stardom: Mayu Iwatani and Tam Nakano defeated Toni Storm and Xia Brookside. April 1, 2018 – Stardom: Xia Brookside defeated Konami to retain the IPW:UK women’s title. April 14, 2018 – EVE: Laura Di Matteo defeated Leah Owens, Nina Samuels and Xia Brookside in a 4-way match. April 22, 2018 – Kamikaze Pro Live #11: Xia Brookside was in the rumble match won by Sean Devine. Xia Brookside defeated Harley Faith. April 27, 2018 – IPW:UK: Xia Brookside defeated Rhia O’Reilly to retain the women’s title. April 29, 2018 – IPW:UK: Xia Brookside vs. Tenille Dashwood ended in a double pin. Brookside retains the women’s title. 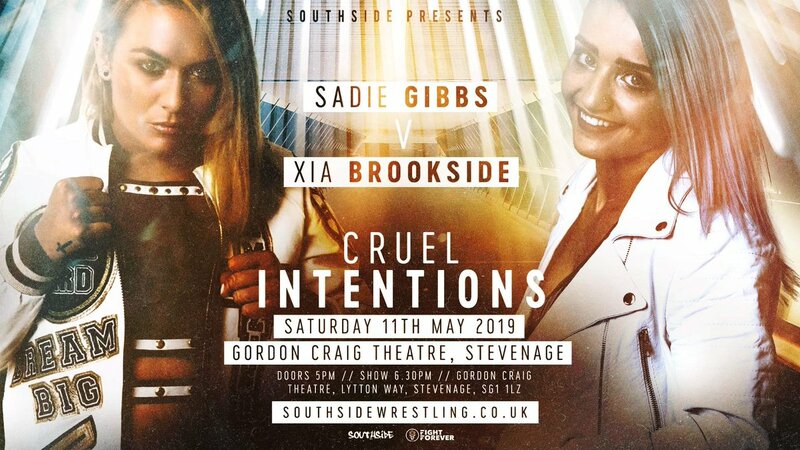 May 2, 2018 – IPW:UK: Xia Brookside defeated Chakara to retain the women’s title. May 4, 2018 – Bellatrix 29: The Angelics (Erin Angel and Xia Brookside) defeated Sigma (Domina and Skarlett). May 5, 2018 – WAW: Leia Elise, Queen Maya and Sammi Baynz defeated Karama, Xia Brookside and Zeeva in a tag team elimination match. May 12, 2018 – RISE 7.5: Deonna Purrazzo defeated Xia Brookside. May 19, 2018 – QOC Supershow 1: Angel Rose defeated Xia Brookside. May 19, 2018 – QOC Supershow 2: Angel Rose defeated Aja Perera, Ray Lyn and Xia Brookside in a 4-way match. May 23, 2018 – Rockstar Pro: Samantha Heights defeated Xia Brookside. May 25, 2018 – APW: Shotzi Blackheart defeated Brittany Wonder, Samara and Xia Brookside in a 4-way match. May 26, 2018 – DEFY: Nicole Matthews defeated Xia Brookside. May 27, 2018 – Inspire Pro: Thunder Rosa defeated Nicole Savoy and Xia Brookside in a 3-way match. May 30, 2018 – RISE Ascent – Episode 1 (Taped): Kikyo defeated Xia Brookside. June 6, 2018 – IPW:UK: Xia Brookside defeated Kay Lee Ray to retain the women’s title. June 23, 2018 – SWE: Xia Brookside defeated Kanji. June 23, 2018 – SWE: Sean Kustom and Xia Brookside defeated The Filthy Kliq (BT Gunn and Kay Lee Ray). July 22, 2018 – IPW:UK: Xia Brookside defeated Zoe Lucas to retain the women’s title. July 28, 2018 – SWA: Xia Brookside defeated Shax. September 1, 2018 – SWE: Kay Lee Ray and Shax defeated Kasey Owens and Xia Brookside. September 8, 2018 – PWC 45: Jinny defeated Xia Brookside to retain the Maiden Of Chaos title. September 8, 2018 – Kamikaze Pro: Xia Brookside defeated Kanji. September 19, 2018 – TCW: Rhio defeated Xia Brookside. September 22, 2018 – IPW:UK: Bobbi Taylor defeated Xia Brookside to win the women’s title. September 26, 2018 – Mae Young Classic (Taped): Io Shirai defeated Xia Brookside in the 1st round. October 5, 2018 – Kamikaze Pro: Lana Austin defeated Xia Brookside. October 6, 2018 – HOPE FXS #3: Fearn Way defeated Xia Brookside. October 24, 2018 – Mae Young Classic (Taped): Jessie Elaban, MJ Jenkins and Xia Brookside defeated Allysin Kay, Reina Gonzalez and Vanessa Kraven in a dark match. October 27, 2018 – SWE: The Jawdroppers (Sean Kustom and Xia Brookside) defeated The All-Knighters (Ricky Knight Jr. and Roy Knight), The 198 (Morgan Webster and Wild Boar) & The Joseph Conners Experience Feat. Ligs (El Ligero and Joseph Conners) in a 4-way tag team match to win the tag team titles. October 28, 2018 – Kamikaze Pro: Xia Brookside defeated Shax. November 9, 2018 – SWE: Shanna defeated Xia Brookside in the 1st round of the Queen Of The Ring tournament. November 11, 2018 – SWE: The Jawdroppers (Sean Kustom and Xia Brookside) defeated Shane Taylor and Shanna to retain the tag team titles. November 21, 2018 – NXT UK (Taped): Rhea Ripley defeated Xia Brookside in the 1st round of the NXT UK women’s title tournament. December 1, 2018 – Kamikaze Pro: Xia Brookside defeated Shanna. December 12, 2018 – NXT UK (Taped): Jinny defeated Xia Brookside. December 26, 2018 – NXT UK (Taped): Xia Brookside defeated Nina Samuels in a dark match. December 28, 2018 – SWE: The Jawdroppers (Sean Kustom and Xia Brookside) defeated Kip Sabian and Shanna to retain the tag team titles. December 29, 2018 – SWE: CCK (Chris Brookes and Kid Lykos) defeated The Jawdroppers (Sean Kustom and Xia Brookside) to win the tag team titles. December 30, 2018 – SWE: Shanna defeated Kanji and Xia Brookside in a 3-way match to retain the Queen Of Southside title. January 9, 2019 – NXT UK (Taped): Isla Dawn defeated Xia Brookside. February 9, 2019 – SWE: Shax vs. Xia Brookside ended in a no contest. March 9, 2019 – Stardom: Mayu Iwatani, Tam Nakano and Xia Brookside defeated JAN (Kaori Yoneyama, Leo Onozaki and Natsuko Tora). March 10, 2019 – Stardom: JAN (Jungle Kyona, Kaori Yoneyama and Natsuko Tora) defeated Mayu Iwatani, Starlight Kid and Xia Brookside. March 21, 2019 – Stardom Afternoon Show: Starlight Kid and Xia Brookside defeated JAN (Jungle Kyona and Saya Iida). March 21, 2019 – Stardom Evening Show: Rebel Kel and Xia Brookside defeated Saki Kashima and Starlight Kid. March 27, 2019 – NXT UK (Taped): Rhea Ripley defeated Xia Brookside. March 28, 2019 – Stardom: Hazuki defeated Xia Brookside to retain the High Speed title. @XiaBrooksideWWE deserves to be NXT UK Women’s Champion. She’s one of the best.